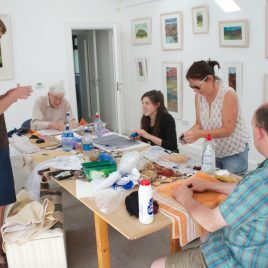 Whether you’re a “never-done-this-kind-of-thing-before” novice or an accomplished artist, an oldster or a youngster, there’s a Connemara Creative Workshop just for you. Our craft and design workshops cover lots of areas such as batik, felt making, tapestry weaving, printmaking and painting for kids. Workshops will be tailored to students requirements and will be offered to groups of four upwards. Suitable for hens parties, families, girlie weekends, couples, teachers, or team building days.